It is made directly from cholesterol within the mitochondria of the adrenal glands and, to a lesser degree, the nervous system, with the help of the cholesterol side chain cleavage enzyme. 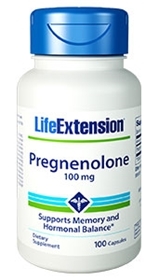 Pregnenolone is a precursor to various hormones, such as progesterone, mineralocorticoids, glucocorticoids, androgens, and estrogens, so it can help the body maintain normal hormone levels, which in turn helps numerous body functions. Other ingredients: rice flour and gelatin. This product contains NO wheat, yeast, gluten, corn, or dairy. Contains NO sugar, artificial sweeteners, flavors, colors, or preservatives. Take one or two capsules daily preferably early in the day on an empty stomach, or as recommended by a healthcare practitioner.